According to the CDC data gathered from 2015 to 2016, “nearly one in five school age children and young people in the United States has obesity.” While obesity has gone down in some places, there’s still a staggering number of inactive children. Childhood obesity is also a lot more damaging than people may think. For example, children who are obese have a higher risk of chronic health conditions that influence their physical health. They are bullied more and teased and it’s very difficult for a child who is obese to fight it in adulthood. Many children who are obese are more likely to be an adult who is obese. 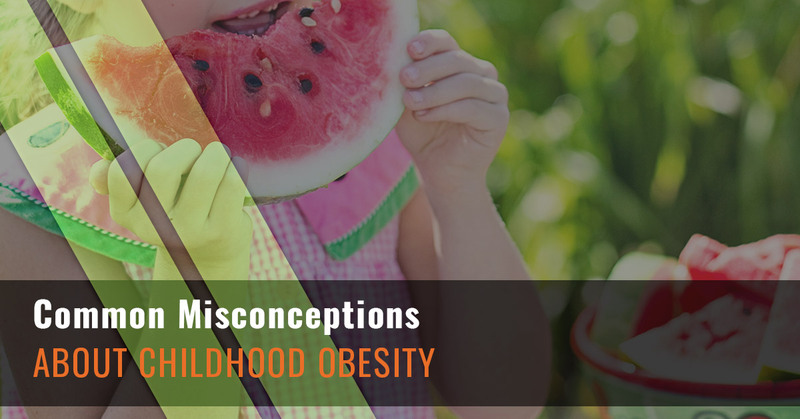 In today’s blog, we’ll be discussing common misconceptions about childhood obesity. Obesity can be very difficult to fight without the full knowledge about it. Obesity isn’t just about eating too much and not taking care of yourself, it’s also about the mental health. At Hot Ground Gym® in Vernon Hills, we’ve touched on childhood obesity in What Exactly Is making Kids Gain Weight?. While people are more aware of what’s going on with weight gain in children, it’s good to start your child early with a love of exercise and healthy living and Hot Ground Gym in Vernon Hills is the perfect place to start. Gaining and losing weight is hard for anyone, but when you’ve spent many years being obese, then it can feel like a battle. There are many misconceptions about childhood obesity and we’re going to address them today. It’s important to note that living healthy is something that takes years to learn. What’s great about Hot Ground Gym is how easy we make healthy living. Our programs are geared to teach teamwork, leadership, problem solving, discipline, and fitness. All of these factors help to contribute against the fight of childhood obesity. Obviously, exercise will help keep your child’s weight down, but discipline will teach your child to learn self-control. Being a leader or a valuable team member will help with self-esteem and problem solving shows that your child can handle any situation and overcome his or her fear. All of these attributes help to make your child more prepared for life’s obstacles, such as living a healthy lifestyle. Many times when a child is struggling the parents are blamed. However, that’s not always the case, sometimes people just don’t know about healthy living and how to fight obesity. Many children who are obese or adults for that matter gain weight for many different reasons not just because they are weak-willed or self-indulgent. It’s vital to note that obesity can run in families, there can be a health issue, a lack of information on portion sizes or not knowing what may or may not be healthy. Many people who feel blame for their child’s obesity just need to take a step back and figure out what’s not working and how it can fixed. For instance, if your child isn’t getting enough exercise, then enroll them in a physical after school activity. Fixing the problem quickly isn’t going to solve it. There is no quick fix to obesity, even with the many different surgeries out there, losing weight is something that takes a long time if you want to do it the healthy way. You may wish that your child could easily drop the weight, but it’ll take much more effort on both yours and your child’s part than supplements or diet pills. You can’t quickly fix the issue, but take time to do research and talk to your child’s pediatrician to figure out a plan that will safely allow your child to lose weight. Losing weight in a quick fashion won’t keep the pounds away, but taking more time to see what’s working and not working will help your child keep the weight off. Your child is growing so it’s easy to assume that they need to eat all of the time to make up for that growth. It’s also easy to think that because a child is growing, they’ll grow into the excess pounds. It’s vital to note that you shouldn’t count on your child growing into their weight. Instead, you should help your child understand healthy eating habits and a fitness level from an early age. If your child is active and eating healthy, he or she will continue to grow and lose the excess pounds. If your child continues to eat without exercising, then a growth spurt isn’t going to cure the excess pounds because he or she is likely to continue to gain weight without losing it. If you’d like to encourage a love of physical fitness, then visit Hot Ground Gym in Vernon Hills.